If you’re going to have cataract surgery, you want to come away with the best eyesight available. However, the standard cataract surgery covered by Medicare only includes monofocal intraocular lenses (IOLs), which will clear up your cataracts but only allow you to see clearly at one distance and don’t help with astigmatism (a misshapen cornea that causes blurry vision). We do offer a number of premium IOLs — such as multifocal and toric lenses — that will allow you to focus at a range of distances and will correct for astigmatism. These lenses will provide you with the vision you remember from a young age: clear of cataracts and quick to focus. Make the choice to come out of cataract surgery with the best vision possible! 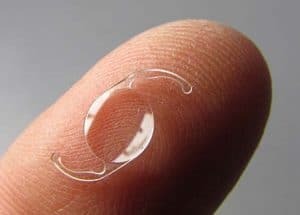 These IOLs are the very latest in artificial lens technology. Using advanced optics, multifocal IOLs provide both near and far focus simultaneously, giving you excellent vision no matter how close or far away you’re looking. While outcomes for multifocal IOLs are great, the implants usually have an adjustment period, which can be a matter of days or weeks. Fortunately, due to the amazingly adaptive human brain and the skills of Dr. Farooq Ashraf, the majority of patients at the Atlanta Vision Institute who chooses multifocal lenses experience excellent results and loves their new lives with clear, sharp vision. Having astigmatism means the cornea is somehow misshapen, causing light that enters the eye to focus incorrectly on the retina, skewing vision. If regular spherical monofocal IOLs are implanted during cataract surgery, they will not correct for your astigmatism. While toric IOLs will still require you to wear glasses for near-vision, your distance vision will be crisp. If you had standard monofocal IOLs implanted, your astigmatism would make external correction necessary for both near and distance vision. Toric IOLs take each individual’s astigmatism into account to provide you with the best vision possible. At the Atlanta Vision Institute, your eyesight is in great hands, and we’ll do whatever is necessary to ensure you have a good outcome after your cataract procedure and sharper vision afterward. For more information about our premium lenses, or to schedule an appointment, call (770) 622-2488. You can also request an appointment by using our easy online form.